Government National Park fees $10 payable at check in, half price $5 for children under 12. 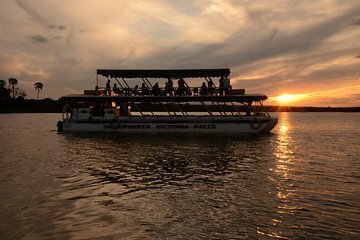 Your sunset cruise kicks off with a transfer from your hotel to your jetty and a welcome ceremony with Ndeble warriors in full costume. Choose from upper or lower deck seating as you board the boat and enjoy complimentary drinks and snacks as you set sail on one of the continent's most famous rivers. A professional guide will point out wildlife along the way as you take in the stunning backdrop of the African sunset. Complimentary return transfers provided. Recommended that you take a jacket as it does get cool once the sun goes down. No Age Restriction – suitable for all members of the family. A lovely way to unwind by watching a variety of animals along the river as the sun sets. Complimentary food and drinks included. Highly recommended. Loved it all. Well planned. fun well run saw lots of hippo. Only problem was the two hours went too quick. Worth doing.